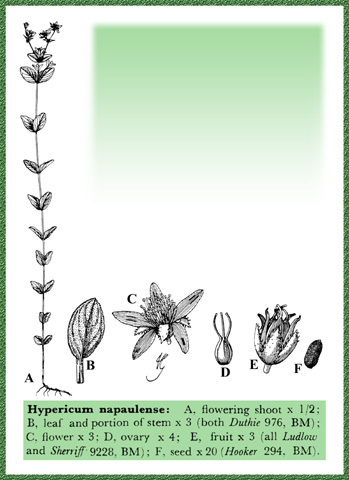 Hypericum L., Sp.P1. 783. 1753. Gen. Pl.ed.341 .1 754 ; W.T.Thiselton Dyer in Hook.f., F1.Brit.Ind.l:253.1874; H.Collett, Fl. Simlensis: 54.1902; R. Keller in Engler and Prantl, Nat. Pflanzenfam., ed. 2.25:175.1925 pro parte excl. Sect IV Elodea; N.K.B. Robson in P.H. Davis, Fl. Turkey, 2:355.1966; in Rech. f., Fl. Iranica, 49, Guttiferae: 1. 1968. Trees, shrubs or perennial to annual herbs, glabrous (in W. Pakistan species), with translucent, red or black glands. Leaves opposite, entire or rarely gland-fringed. Flowers solitary or in terminal dichasial to monochasial cymes or panicles. Sepals 5, quincuncial or rarely 4, decussate, glandular like the leaves. Petals 5(4), yellow, often tinged or veined red, deciduous or persistent. Stamens fascicles 5(4), antepetalous, free or variously united (often 2+2+1, forming `3'fascicles), deciduous or persistent; filaments slender, free or united; anthers dorsifixed, with an amber or black gland on the connective. Ovary 1-5-locular, with (2)3-5 placentae; styles (2)3-5, free or ± united, slender; ovules 2 to numerous on each placenta. Fruit a septicidal capsule or rarely tricoccoid or indehiscent. Seeds sometimes winged or carinate, with variously patterned testa. A genus of c. 400 species, almost cosmopolitan, but absent from arctic regions and rare in Australasia (2 species) and lowland tropical regions. Hypericum hookeranum var. leschenaultii sensu Dyer = Hypericum choisianum Wall. Hypericum oblongifolium* sensu Wall., Numer. = Hypericum choisianum Wall.